Lance Kirshner, team leader of the LAKE Group within @properties, is in the top 1% of producing agents in the Chicago area. A broker since 2004, Lance created the LAKE Group of real estate brokers to offer his expanding referral client base highly specialized services, that when paired with @properties™ unparalleled marketing expertise, creates a seamless professional transaction process. Lance is a Chicagoland native, a graduate of University of Illinois (Urbana-Champaign) and is both a licensed Realtor and a certified residential appraiser. With his degree in Entrepreneurship/Business Administration and his commitment to continuing education in all facets of the real estate industry, Lance is able to guide his clients through the many vagaries of the buying and selling process. Having both sales and appraisal licenses allows Lance to accurately value properties and best position his clients to reach their real estate goals. Lance has led the LAKE Group to posting sales volume of approximately $60 million in 2015 and 2016. I get tremendous satisfaction in helping guide clients through these important financial decisions, which can be very stressful. It is my goal to make all my clients as confident as possible in their decisions by giving them extensive market information, and solid financial advice. I strive to build client relationships for life. 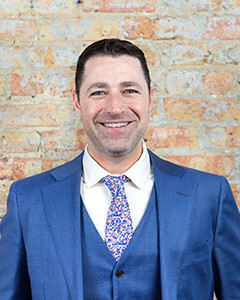 Lance thoroughly enjoys the many aspects of living in the Chicago metro area, currently residing in the Bucktown neighborhood with his wife Amanda and their two Goldendoodles. Whether a buyer or a seller, I look forward to providing you with the absolute best concierge level service available.